As the need to securely store bitcoin and other cryptocurrencies has evolved, the technology available to keep digital assets safe has also developed to meet our growing demands. Hardware wallets are a special type of crypto wallet which stores the user’s private keys in a secure physical device. They often resemble a USB drive or small ‘dongle’. Whilst the exterior of the wallet may seem quite simple on the surface, a great deal of thought and research has gone into the actual production and design of these wallets to ensure that they do their job properly. For the purposes of long-term storage and keeping your funds secure, a hardware wallet is an essential part of the modern crypto investor’s toolkit. The main reason why people use hardware wallets is for security. When properly setup, hardware wallets can be safely used on malware-infected computers, as transactions are signed without the private keys ever leaving the device. Hardware wallets can manage a few hundred dollars worth of bitcoin just as competently and securely as they can handle a few million dollars worth. Most of the time, these wallets operate using open source software, which means that the entire operation of the device can be independently audited and verified to ensure that it is legitimate. Furthermore, hardware wallets are designed in a way that prevents third-party software from being installed or stored on the device. This makes them much more secure than standard operating systems. Some models require manual confirmation of transactions (by pressing a button on the wallet or entering a PIN code) before any spends can be approved – providing an added security layer. As these devices are becoming more widely used, manufacturers are racing to make their wallets compatible with a wide range of different blockchains. Rather than managing keys for half a dozen different wallets, why not keep your bitcoin, ethereum, litecoin and ripple all on the same secure device? Malware swaps recipient bitcoin address – viruses on an infected computer have been known to detect when a bitcoin address has been copied to the clipboard. They can then change it to another address which is controlled by the hacker, effectively siphoning off any bitcoin sent to the perpetrator. A simple way to prevent this attack from occurring is to double check the address that you’re sending coins to before confirming any transactions. 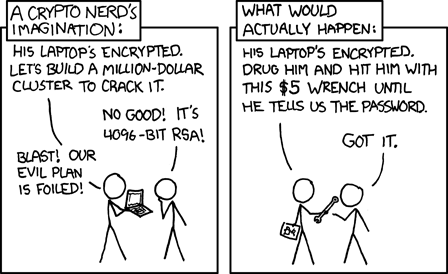 Insecure random number generator – hardware wallets have a random number generator built into them. This is used to generate mnemonic keys/seed phrases to recover lost wallets with. However, it is very difficult to verify the randomness of number generators. If the wallet had been tampered with, somebody could potentially alter the number generator to create a predictable sequence of numbers. They could then reproduce the seed phrase used to generate the wallet and use this to steal any cryptocurrency stored within. Imperfect implementation – even if the wallet and software design is perfect, bugs at the software, hardware or firmware level can create vulnerabilities. This is the case with any computing device. To date, no wallet in existence is implemented using provably correct software. Compromised production process – if a corrupt person working on the production line introduces a backdoor to the wallet, or some details are overlooked during the manufacturing process, a ‘hole’ could be introduced into the final product. This is a real risk for high value financial applications. Compromised shipping process – there have been cases of people swapping hardware wallets with identical-looking replicas during transit, then stealing the private keys from the purchaser at a later date. This can be prevented through buying your wallet from a reputable supplier and always generating a new seed key before use. Potentially incompatible with future blockchain forks – if a fork of an existing blockchain is conducted, it is not necessarily guaranteed that the newly forked coins will be accessible on the hardware wallet. However, manufacturers tend to be quite proactive about supporting popular chain forks and finding the best solution for their users. Your hardware wallet is a valuable device. It’s like your own personal security vault for cryptocurrencies. Therefore, it’s important to buy a quality model from a reputable supplier. NEVER buy hardware wallets second hand, and always follow the manufacturer’s setup instructions. Make sure to generate a new seed phrase/mnemonic key – this is a string of random words which can be used to recover your wallet if anything ever goes wrong. Make sure to store this key in a secure place such as a security deposit vault, and never keep it on a device that is connected to the internet. It is best to physically store your backup phrase away from technology. Another option for keeping your recovery phrase safe is to split it into two or more pieces and give each component to someone you trust – that way, to recover your coins, you need information from multiple people, but none of them can access your assets without the other parts of the puzzle. Keep multiple backups of your seed phrase on multiple mediums. This way, if one of your backups is lost or destroyed, you can still access the coins stored within your wallet. It is also important to consider the type of materials that the key will be recorded on. For example, if you’re planning to record the backup phrase on paper, make sure to write it in pen instead of pencil and consider laminating the document or storing it in a waterproof ziplock bag. If you decide to print the backup phrase, make sure that your printer is not connected to the internet and does not store copies of printed documents in the internal memory. Whilst this might seem overly cautious, it’s important to remember where bitcoin and other cryptocurrencies have come in the past few years. You might be sitting on a small (or large) fortune in a few years time – the last thing anyone wants to do is lose wealth due to sloppy security measures. In many ways, owning bitcoin is similar to owning gold. Remember to be careful about who you tell. There have been many cases in the past of people showing off their crypto wealth only to be robbed or kidnapped by people wanting to steal their coins. For more practical tips on how to keep your cryptocurrencies safe and secure, check out our informative guide here. With a sleek design, intuitive user interface and wide support of various coins, this model is a great option for most investors and traders. Whether you’re just getting started or have a deep understanding of blockchains, the Ledger Nano S provides all the functionality necessary to manage your crypto assets with ease. You can access your ledger wallet through the Ledger Live desktop application which enables you to view the total balance of your coins, with real-time rates – even when your device isn’t connected to a computer. Many of the popular coins are supported including bitcoin, litecoin, NEO, zcash, ripple, ethereum and most ERC-20 tokens. 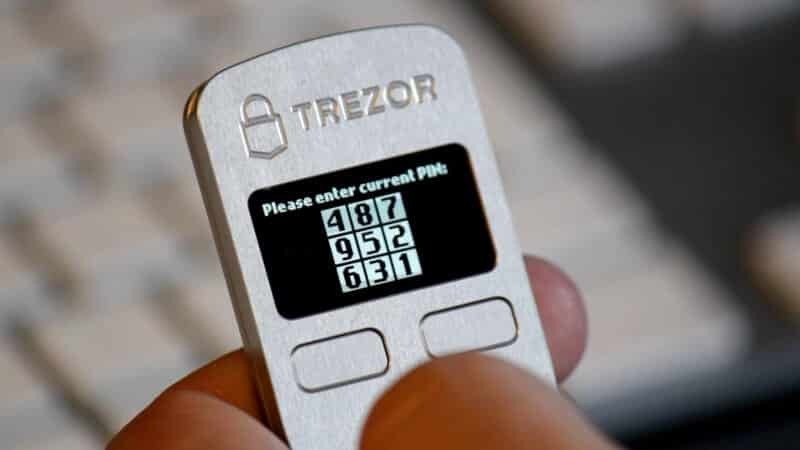 As an established wallet manufacturer, TREZOR has a great reputation for producing reliable crypto storage devices. This model uses a deterministic wallet structure which means that it can hold an infinite number of key pairs. These keys are generated from the recovery seed. Most of the major coins are supported, and TREZOR is continuously adding functionality for new blockchains and crypto projects. Here is a list of over 500 coins that TREZOR wallets support. The latest TREZOR wallet has all the bells and whistles. Equipped with an interactive touch screen, widespread support for most cryptocurrencies and a magnetic charging dock, this product has been well thought-out. There are a range of handy features such as a sealable USB port and an SD card slot for onboard encrypted storage (that doesn’t have access to your private keys or recovery phrase). If usability and security are the most valued features, then the Model T will not disappoint. There are a range of other hardware wallets on the market such as the KeepKey, Safe T Mini and ColdCard products, which are designed with various purposes and features in mind. However, the options listed above are the most popular and widespread hardware wallets in existence at the time of writing. If you’re serious about cryptocurrency, and plan to own bitcoin for an extended period of time, then it’s worth considering whether to use a hardware wallet. They protect your coins with military grade encryption, and provide peace of mind so that you can rest comfortably knowing that your digital assets are safe. The future is uncertain – nobody knows how much bitcoin, ethereum or any other cryptocurrency will be worth in the coming years. By getting your security right from the outset, you can be confident that your savings aren’t vulnerable to loss or theft. Blockchains create freedom from the need to trust third parties such as financial intermediaries. By interacting with bitcoin, we are essentially becoming our own banks. Whilst there are a wide range of clear benefits that come from such autonomy and freedom, it also means that we are solely responsible for keeping our crypto wealth secure. To learn more about the different types of wallets (such as software, paper and web wallets), check out our detailed guide here. Cryptosaver is an online bitcoin broker and savings platform based out of sunny Australia. We help you to get involved in this exciting market by providing an easy way to buy, sell and save bitcoin from the comfort of your own home. Click here to find out more.